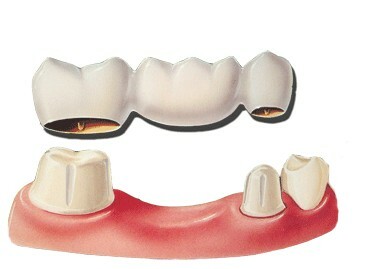 A bridge is a replacement tooth or teeth that fill the space where one or more teeth are missing. The bridge restores your bite and helps keep the natural shape of your face. A missing tooth is a serious matter. Teeth are made to work together. When you lose a tooth, the nearby teeth may tilt or drift into the empty space. This can affect your bite and place more stress on your teeth and jaw joints, possibly causing pain. Teeth that have tipped or drifted are also harder to clean putting them at higher risk for decay and gum disease. When a tooth is missing, the bone may shrink. It that happens, it may change the way your jawbone supports your lips and cheeks. Over time this can make your face look older. Placing a bridge usually takes more than one visit. On the first visit, your dentist prepares the teeth on both sides of the gap. These are the teeth the bridge will be attached to. The dentist then takes an impression using the digital scanner and sends it to the lab for the bridge to be custom fabricated. You will have a temporary bridge in place for 2 weeks until your final bridge is ready.